Posted on Wed, Jan 25, 2012 : 5:41 p.m. Instead of being pounded into the boards, Michigan senior captain Luke Glendening, right, can focus on more light-hearted moments during the Wolverines' off week. Like beating his teammates in a skills competition. There is a decidedly more relaxed air about the Michigan hockey team going into its off week compared to the last time it enjoyed a break. In December, Michigan was 2-0-1 in its last three games, having just come out of the funk of a seven-game winless streak heading into the holiday break. Coach Red Berenson was worried time off might kill the momentum. “You just about wish the break weren’t right now because we were starting to getting a little traction,” Berenson said at the time. The team’s momentum stuck around well past the holiday season to the tune of a 6-1-1 run. The Wolverines found their form and climbed to No. 9 in the polls. With eight games left in the regular season, Berenson now is more welcoming of a weekend without games. 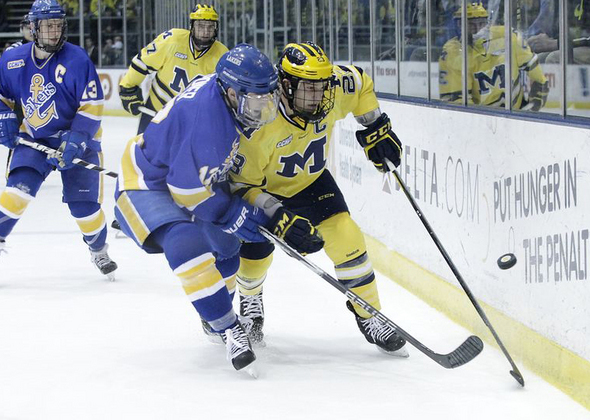 The Wolverines don’t play again until they host Miami (Ohio) on Feb. 3-4. Berenson said not having a game helps the team focus on its own improvements, rather than just prepare for an opponent. The off week is coming at a perfect time physically for the team, as well, after splitting a rough series with Notre Dame. Senior captain Luke Glendening agreed, saying "it's kind of nice to have that break on your body." In addition to a day off from practice on Monday, this week includes small competitions within the team — such as a 3-on-3 tournament and a possible skills contest — to keep the atmosphere a little lighter than normal. Brown said he expects to win, a claim Glendening refutes. “We’re going to try and get better this week and if we can have some fun along the way and some friendly competition, that’ll be good too,” Berenson said. All three of Michigan’s goals in its series against Notre Dame came on the power play, which is as many as it had scored in its previous 11 games. Berenson said it’s a relief to have ended the dry spell, which included four consecutive games (14 opportunities) without a power-play goal.